new and used parts for most van ute and 4x4's If we don't have it we can find it for you and usually get the part in overnight. 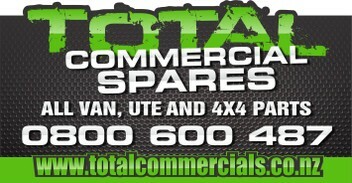 At Total commercials we do our very best to offer you the right part at the right price while also giving you a great service. If for some reason we dont have the part you require we will hunt high and low to find it for you. we also have a huge range of brand new parts at prices others cant match. Great service, Great team, Delivery was supa quick ( next day to Auck) Thanks guys, Im comming back for more goodies. Daniel: Thank you, we do our very best to provide good service, we look forward to helping with your future parts needs. hey do u have any mazda bongo or econovan motors for a 87 econovan.if so how much? This firm gave me brilliant service. My vehicle got broken into and the window smashed. The next morning I searched TM for a replacement window. At 6.30am I sent a message to Total Commercials for price and availablity. Within minutes I had a reply. At 7pm I purchased the window thru TM and paid thru internet banking. I was promised delivery by lunchtime that day. Astounding, my payment was not even confirmed!. At 11.30am on that same day the goods arrived. Abosultely brilliant Service.